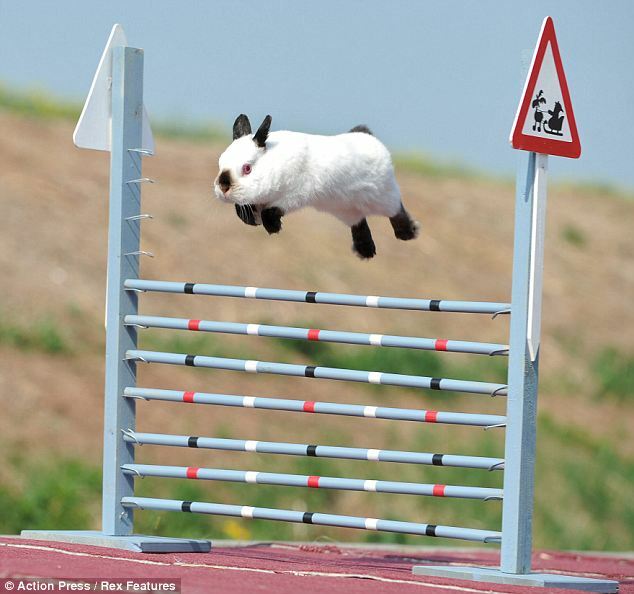 Snoopy, the star high-jumping rabbit of the Jena Kaninhop club. You don’t have to be an awesome high-jumping creature like Snoopy the rabbit to complete the newly established “High Jump” (V7/8). 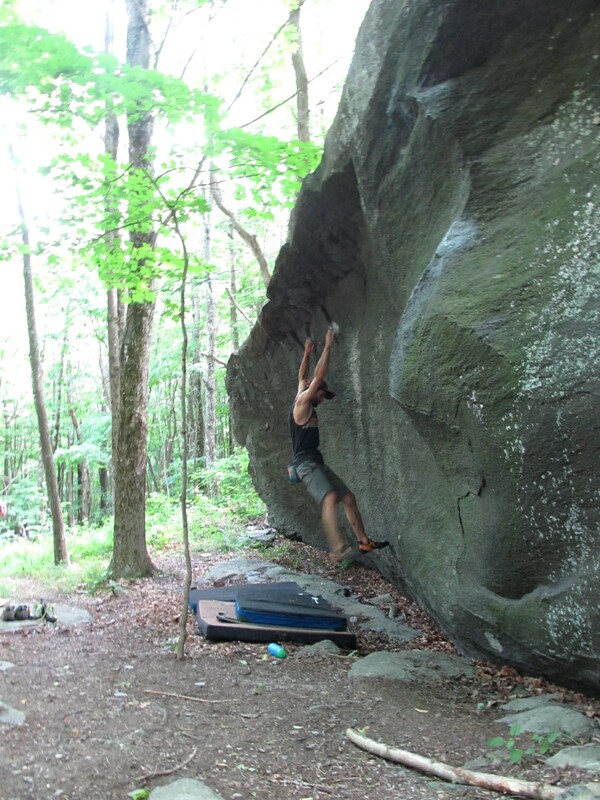 However, If you are naturally gifted with the unusual ability to leap up & cling to small crimp edges -or just psyched to try out a new boulder problem- definitely stop by the Thews Boulder next time you visit GHSP! on any of the small, smeary nubs at the base of the gently overhung boulder. The start move is a standing jump to the overhead rails just below the small overhead roof. The crux of the line is latching both of the small diagonal rails and hanging on, although the moves that follow are fairly sustained. 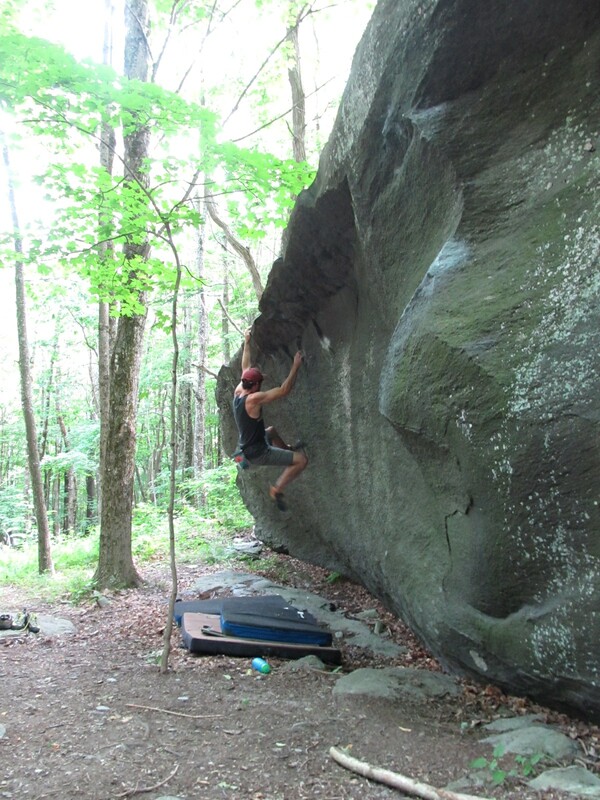 Jumping up for the start, the first holds are a right hand “lightning bolt” shaped diagonal crimp rail, the left is a slanted crimp/pinch with a low thumb-catch. While the starting jump & deadpoint up to these holds is fairly low percentage, once accomplished the sequence afterward is a lot of fun. Posing and doing the move to the lip after the FA of High Jump. After locking off on the crimps, smear feet on anything available and “campus” out to the pinches at the lip of the roof. Trend slightly left on the longer pinch feature and heel hook out to the right over the roof. Gain the high, vertical, right facing gaston and press out a dicey mantle over the roof to finish. 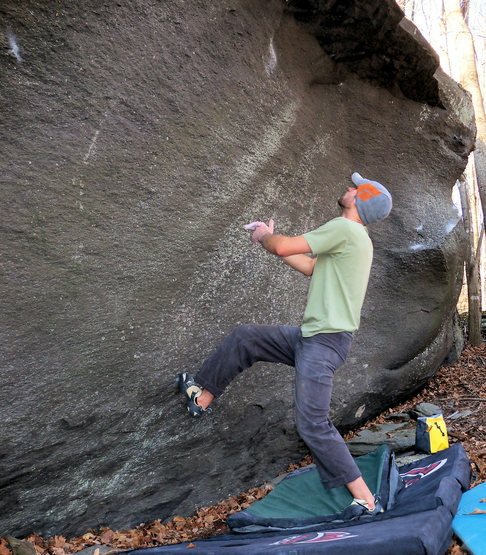 While you could stack three or four pads up and simply reach up to the high crimps, the jump is considered part of the problem. Let us know when you repeat the line and if you have a better suggestion for the grade. Happy High-Jumping!